Hey guys! I know I haven’t been very regular with my posts, but I’ve been really tired after all my freelance writing. I’ll try to get another post up when I can. In the meantime, here’s a quick book review! Finally! The last book of the Paper God series! I waited not so patiently to get through my other books, so I could finally find out what happens to Katie, Tomo, and Jun. My overall response? It was okay. Yeah, I was a little disappointed in this one. Don’t get me wrong, it was in no way bad. It just seemed very bland compared to the first two books Ink and Rain. I mean we do get a monster battle in this one, but everything just ended way too neatly. It reminded me a lot of the disappointment that was Breaking Dawn. Only I preferred this one a lot. Some of the things I did like about it was we find out the truth about Ishakawa, though I honestly wished he could have told Tomo. I like that we got to learn about Katie’s dad and I like that the ending with Jun was very ambiguous. But even though Katie and Tomo are searching for ancient treasures almost the whole time, I just felt like their interaction was lacking. You think things would be more interesting when you are trying to save the world. I mean you are dealing with ancient powerful gods and it just seems too easy. Even the romance seemed boring and almost forced. It fact, I found their love to be more believable in the last two books. Overall, kind of a bland ending to the trilogy. I gave this book 3/5 stars on Goodreads. 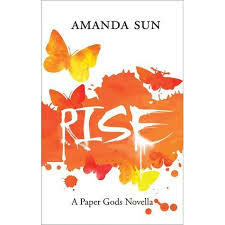 I found Rise to be the superior novella to Shadow and it takes place after book two (Rain) of the Paper Gods series. The sad and mournful tale of the two Kami in a love gone wrong was very well balanced with the new and blossoming love of Yuki and Tanaka. Rise is similar to Shadow as it also tells two alternating stories. One is the modern love blooming between Yuki and Tanaka and the other is way back from when the Earth was first formed between the two kami; Izanami and Izangi. The imagery used to create the Kami world is awe-inspiring even when things go wrong. I don’t really have too much to say about this one. It is a great addition to the Paper Gods series and is a light read. But beware that there are joyous moments mixed with sad ones. I don’t usually like to read more than one book at a time. A lot of my friends that are also avid readers always look at me with a puzzled look on their faces when I say that. Reading more than one book at a time really seems like a common practice when it comes to dedicated book lovers. But even when I was a teen and a young child, I always had to read one book at a time. This quirk of mine would come in handy when I was in college because by doing this I find that I really absorb the literature better this way and really take something from it. 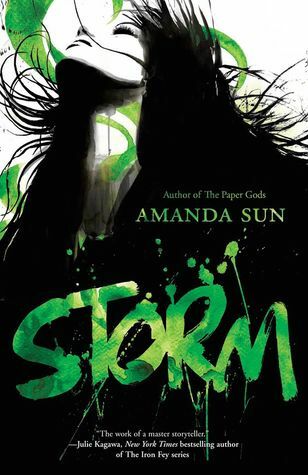 However, when I logged on the internet to check the release date for the final book in the Paper Gods series, I discovered that Amanda Sun actually wrote two companion novellas for the franchise. This one, Shadow, is the prequel to the events that occur in Ink. The next one, Rise, takes place after book two. Since I am in the middle of reading the series, I thought it would be best to put my current book aside and read these pieces. Please note that these books are only available on an E-Reader. I felt that Sun was strongest at writing emotions for this novella. I really felt for Katie who was crumbling after the death of her mother. Not to mention that her only choice was to move to another country! The emotions were very real with exploring that very stressful situation. 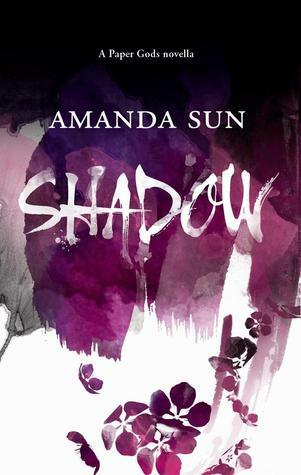 Shadow is told in two perspectives, so the reader switches between Katie and Tomo before they actually meet. I like that the reader gets to see what Tomo’s relationship with Myu was like before Ink. Since it is actually his break up with Myu that moves the events in Ink forward. It really makes that break up all the more sad after I actually read it. Even though I am a total Katie X Tomo shipper. However, this little novella reads a lot less interesting than the actual full length books. But that’s actually to be expected since it is setting everything up. My biggest problem with it was that Sun actually shows the readers the nightmares that Tomo is always describing in Ink and well, they are boring. But that could just be my opinion. They don’t read as particularly horrifying or vivid to me. These novellas aren’t required reading for the series, but I would recommend them if you want more background information on the characters or if you’re just a fan. I think Rain was a strong sequel to Ink. Most readers seem to have a problem with the “insta-love” that develops between Tomo and Katie. I really do understand their concern. They do fall for each other rather quickly in the first book and if you hated that, you probably won’t care much for this one either. However, I can say that the romance between Tomo and Katie is a bit toned down for more action and more love triangles! Yet another Y.A. stereotype, lots of love triangles in this novel! I think the main ones are Tomo X Katie X Jun and Katie X Tomo X Shiori. If you don’t like love triangles, stay away. I guess I’m lame because I love them. I know we’re really supposed to be sympathetic to Shiori, but she embodies everything I hate about teenage girls. Ugh. I won’t give away details, but I totally saw the direction of Jun’s story arc from a mile away. I think his character is the most predictable. However, there were some plot twists involving Katie and Tomo that I did not see coming. 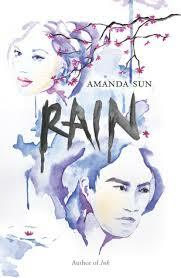 In fact, I think Amanda Sun did a much better job with the plot for Rain than in Ink. Rain continues the story of Ink with Katie and Tomo trying to figure out how to control Tomo’s power and stay together. However, Jun thinks that Tomo does nothing but endanger Katie and Shiori believes that Katie doesn’t deserve Tomo. As all that drama unfolds, more details about the Kami is revealed. To sum up, this series reads like a manga or anime cartoon. It is a romantic action story with a lot of love triangles thrown in. If you think you would like that, give this series a go. I gave this book 4 out 5 stars on Goodreads. Note: Hi guys! I know I haven’t written in a long time, but a lot of major things have happened in my life. In fact, I plan to write a big, long post about it soon to fill all of you in. Until then, please enjoy this book review. This book is not perfect. Like some reviewers have said before me, it follows a lot of cliches that Y.A. books keep in rotation. But sue me, I still really enjoyed this novel. Sure, Katie is the typical seemingly ordinary heroine that we later learn is special and she pretty much falls in love with Tomo instantly, but this book does have some merit. 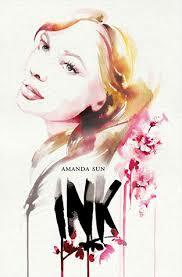 Ink centers on Katie Greene, who has just lost her mother and is forced to stay with her aunt in Japan temporarily. Naturally, she wants to return home to Canada, but after she meets Tomohiro things begin to change. Whenever Katie sees Tomo strange things start to happen. Her pen explodes in class and she starts seeing ink run everywhere. Once she learns about Tomo’s secret, her life is changed and she could be in danger. As I mentioned before, the book does have its cliches. But the way the author writes about the Japanese culture really drew me in and I love that she included a glossary in the back of the book. The cover and illustrations are absolutely breathtaking and despite the flaws I find myself really rooting for these characters. The ending is a bit disappointing because I called it from a mile away, but I did pick up the sequel and I will finish the series. I am a huge anime and manga fan and if you think of it like a cute little anime romance, it really is quite enjoyable. Check it out if you’re into that. If you’re absolutely sick of Y.A. tropes, you should probably stay away. I gave this book 4/5 stars on Goodreads.